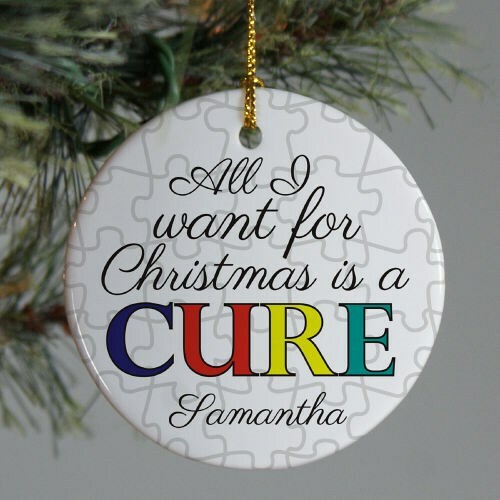 If all you want for Christmas is a cure for autism, then this is just the awareness ornament that you'll want to hang on your Christmas tree. By banding together, we can make a difference and educate others about all forms of autism and treatment options that are available. This "All I Want for Christmas is a CURE" Ceramic Ornament is a flat ornament and measures 2.75" in diameter. The Ornament includes a ribbon loop so it can easily hang from your tree or ornament stand. Free personalization of any name is included. This autism awareness ornament will allow you to show your passion and dedication to both spreading awareness and helping in the fight for a cure to this difficult disorder. Our Autism Ribbon Snowman Ornament is another great option.